The key role played by these agencies means that Western media often report on the same topics, even using the same wording. 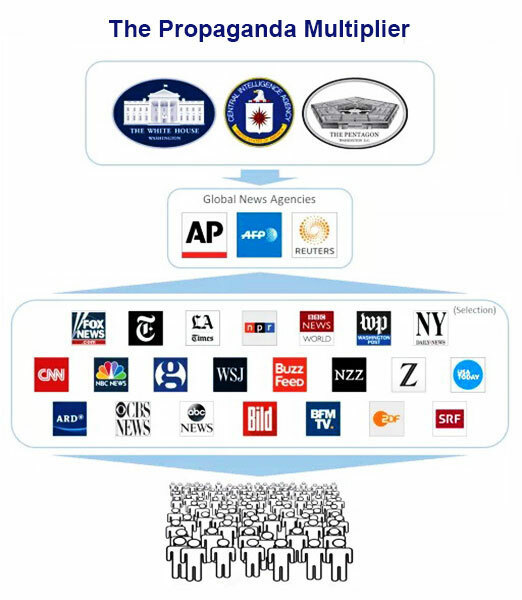 In addition, governments, military and intelligence services use these global news agencies as multipliers to spread their messages around the world. “The main source of information is stories from news agencies. The almost anonymously operating news agencies are in a way the key to world events. “The news agencies are the most important suppliers of material to mass media. So what are the names of these agencies that are “always at the source of the story”? In addition, many countries run their own news agencies. However, when it comes to international news, these usually rely on the three global agencies and simply copy and translate their reports. “News agencies are rarely in the public eye. Yet they are one of the most influential and at the same time one of the least known media types. However, there is a simple reason why the global agencies, despite their importance, are virtually unknown to the general public. The motive for this discretion, however, should be clear: news outlets are not particularly keen to let readers know that they haven’t researched most their contributions themselves. but do not label it at all. “Agency contributions are exploited integrally without labeling them, or they are partially rewritten to make them appear as an editorial contribution. The agencies play a prominent role not only in the press, but also in private and public broadcasting. the news agencies DPA/AP, Reuters and AFP: one German/American, one British and one French. 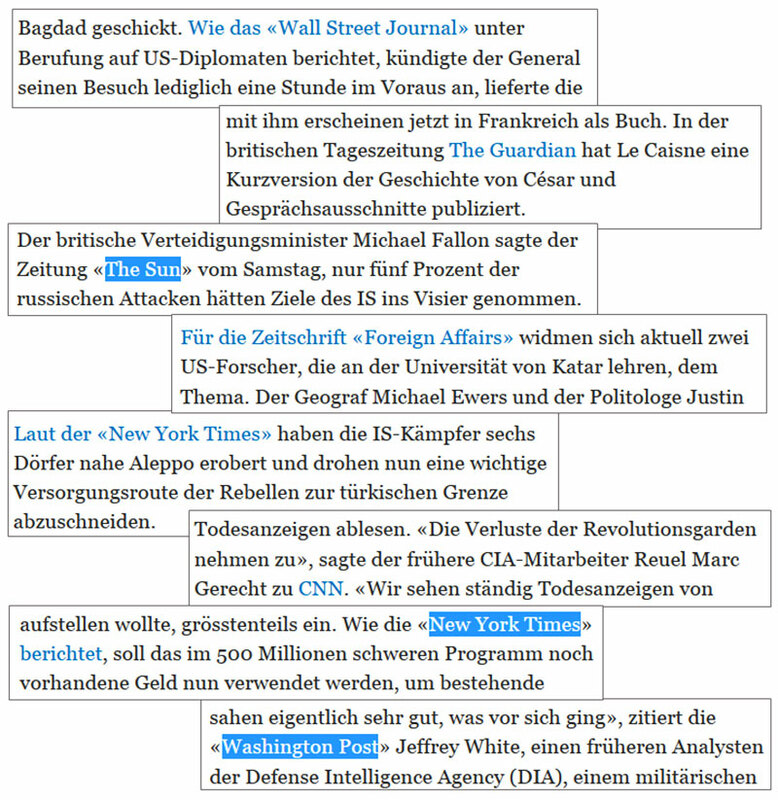 Swiss Radio and Television (SRF), too, largely bases itself on reports from these agencies. In fact, not only the text, but also the images, sound and video recordings that we encounter in our media every day, are mostly from the very same agencies. What the uninitiated audience might think of as contributions from their local newspaper or TV station, are actually copied reports from New York, London and Paris. from Vienna to Washington, our media often report the same topics, using many of the same phrases – a phenomenon that would otherwise rather be associated with “controlled media” in authoritarian states. due to reports by global news agencies. Much of our media does not have own foreign correspondents, so they have no choice but to rely completely on global agencies for foreign news. But what about the big daily newspapers and TV stations that have their own international correspondents? while the global agencies have several thousand employees worldwide, even the Swiss newspaper NZZ, known for its international reporting, maintains only 35 foreign correspondents (including their business correspondents). In huge countries such as China or India, only one correspondent is stationed; all of South America is covered by only two journalists, while in even larger Africa no-one is on the ground permanently. Moreover, in war zones, correspondents rarely venture out. On the Syria war, for example, many journalists “reported” from cities such as Istanbul, Beirut, Cairo or even from Cyprus. In addition, many journalists lack the language skills to understand local people and media. How do correspondents under such circumstances know what the “news” is in their region of the world? “I’d imagined correspondents to be historians-of-the-moment. When something important happened, they’d go after it, find out what was going on, and report on it. But I didn’t go off to find out what was going on; that had been done long before. I went along to present an on-the-spot report. The editors in the Netherlands called when something happened, they faxed or emailed the press releases, and I’d retell them in my own words on the radio, or rework them into an article for the newspaper. This was the reason my editors found it more important that I could be reached in the place itself than that I knew what was going on. The news agencies provided enough information for you to be able to write or talk you way through any crisis or summit meeting. Our men and women in London, Paris, Berlin and Washington bureaus – all thought that wrong topics were dominating the news and that we were following the standards of the news agencies too slavishly. The common idea about correspondents is that they ‘have the story’, but the reality is that the news is a conveyor belt in a bread factory. The correspondents stand at the end of the conveyor belt, pretending we’ve baked that white loaf ourselves, while in fact all we’ve done is put it in its wrapping. Afterwards, a friend asked me how I’d managed to answer all the questions during those cross-talks, every hour and without hesitation. When I told him that, like on the TV-news, you knew all the questions in advance, his e-mailed response came packed with expletives. The central role of news agencies also explains why, in geopolitical conflicts, most media use the same original sources. In the Syrian war, for example, the “Syrian Observatory for Human Rights” – a dubious one-man organization based in London – featured prominently. The media rarely inquired directly at this “Observatory”, as its operator was in fact difficult to reach, even for journalists. Rather, the “Observatory” delivered its stories to global agencies, which then forwarded them to thousands of media outlets, which in turn “informed” hundreds of millions of readers and viewers worldwide. The reason why the agencies, of all places, referred to this strange “Observatory” in their reporting – and who really financed it – is a question that was rarely asked. “A news story does not become more correct simply because one is able to provide a source for it. It is indeed rather questionable to trust a news story more just because a source is cited. Behind the protective shield such a ‘source’ means for a news story, some people are quite inclined to spread rather adventurous things, even if they themselves have legitimate doubts about their correctness. Dependence on global agencies is also a major reason why media coverage of geopolitical conflicts is often superficial and erratic, while historic relationships and background are fragmented or altogether absent. if the agencies do not report on something, then most Western media will not be aware of it. “Often the mass media do not report on reality, but on a constructed or staged reality. In fact, due to the rather low journalistic performance of our media and their high dependence on a few news agencies, it is easy for interested parties to spread propaganda and disinformation in a supposedly respectable format to a worldwide audience. “The critical sense gets more lulled the more respected the news agency or newspaper is. Someone who wants to introduce a questionable story into the world press only needs to try to put his story in a reasonably reputable agency, to be sure that it then appears a little later in the others. Among the most active actors in “injecting” questionable geopolitical news are the military and defense ministries. For example, in 2009, the head of the American news agency AP, Tom Curley, made public that the Pentagon employs more than 27,000 PR specialists who, with a budget of nearly $ 5 billion a year, are working the media and circulating targeted manipulations. In addition, high-ranking US generals had threatened that they would “ruin” the AP and him if the journalists reported too critically on the US military. “With the help of the media, the military determine the public perception and use it for their plans. They manage to stir expectations and spread scenarios and deceptions. In this new kind of war, the PR strategists of the US administration fulfill a similar function as the bomber pilots. The special departments for public relations in the Pentagon and in the secret services have become combatants in the information war. The US military specifically uses the lack of transparency in media coverage for their deception maneuvers. The way they spread information, which is then picked up and distributed by newspapers and broadcasters, makes it impossible for readers, listeners or viewers to trace the original source. What is known to the US military, would not be foreign to US intelligence services. “The basic theme was to make it look like an [enemy] aggression in Angola. So any kind of story that you could write and get into the media anywhere in the world, that pushed that line, we did. One third of my staff in this task force were covert action, were propagandists, whose professional career job was to make up stories and finding ways of getting them into the press. The editors in most Western newspapers are not too skeptical of messages that conform to general views and prejudices. “We based our reports on official communications. It was not until years later that I learned a little CIA disinformation expert had sat in the US embassy, in Lusaka (Zambia) and composed that communiqué, and it bore no relation at all to truth. Of course, the intelligence services also have a large number of direct contacts in our media, which can be “leaked” information to if necessary. But without the central role of the global news agencies, the worldwide synchronization of propaganda and disinformation would never be so efficient. 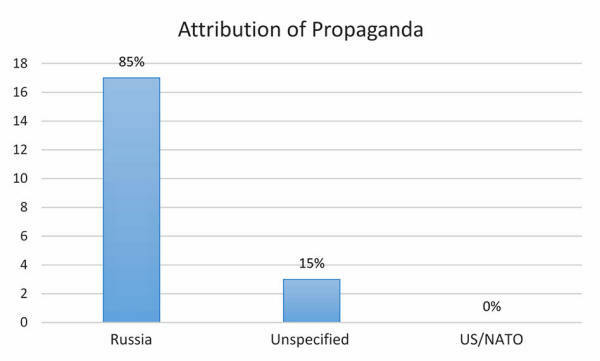 Through this “propaganda multiplier”, dubious stories from PR experts working for governments, military and intelligence services reach the general public more or less unchecked and unfiltered. The journalists refer to the news agencies and the news agencies refer to their sources. Although they often attempt to point out uncertainties with terms such as “apparent”, “alleged” and the like – by then the rumor has long been spread to the world and its effect taken place. their messages to a worldwide audience. For example, news outlets like the New York Times or BBC have up to 100 foreign correspondents and other external employees. “Dutch news teams, me included, fed on the selection of news made by quality media like CNN, the BBC, and the New York Times. We did that on the assumption that their correspondents understood the Arab world and commanded a view of it – but many of them turned out not to speak Arabic, or at least not enough to be able to have a conversation in it or to follow the local media. 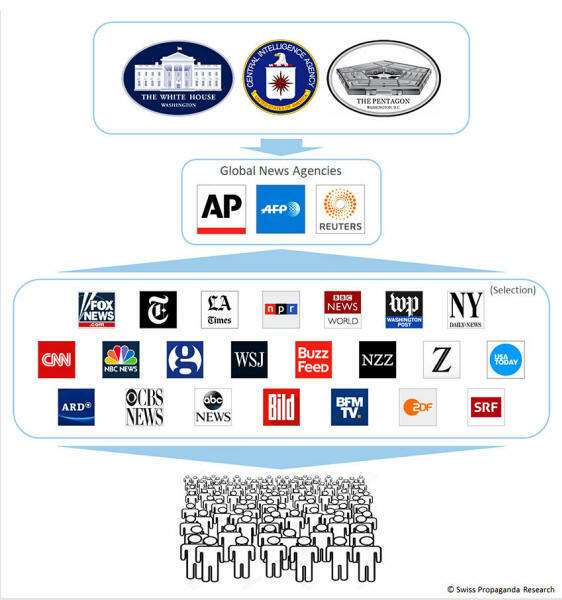 In addition, the sources of these media outlets are often not easy to verify (“military circles”, “anonymous government officials”, “intelligence officials” and the like) and can therefore also be used for the dissemination of propaganda. In any case, the widespread orientation towards the Anglo-Saxon publications leads to a further convergence in the geopolitical coverage in our media. 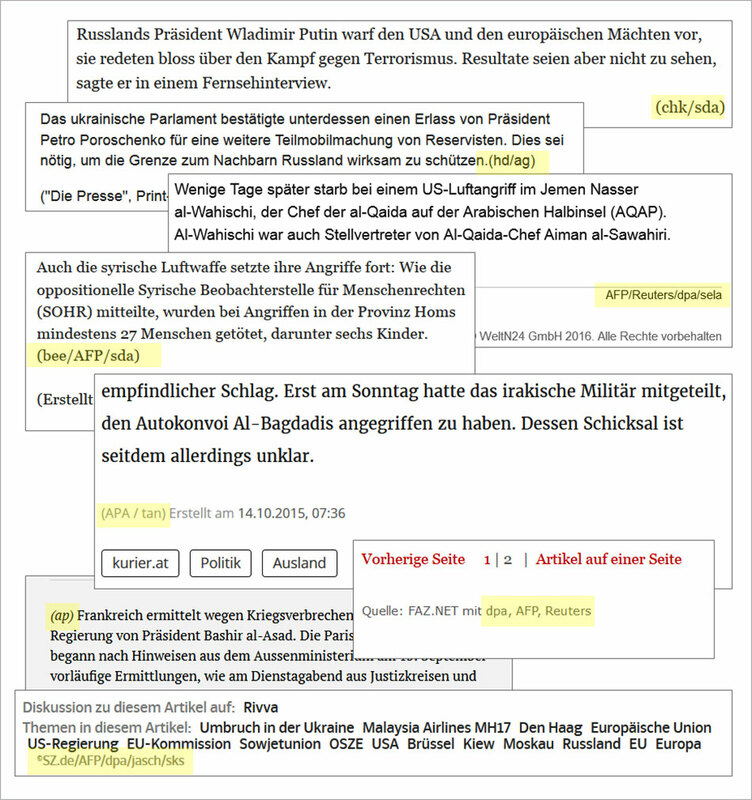 The following figure shows some examples of such citation based on the Syria coverage of the largest daily newspaper in Switzerland, Tages-Anzeiger. But why do journalists in our media not simply try to research and report independently of the global agencies and the Anglo-Saxon media? “You might suggest that I should have looked for sources I could trust. I did try, but whenever I wanted to write a story without using news agencies, the main Anglo-Saxon media, or talking heads, it fell apart. Obviously I, as a correspondent, could tell very different stories about one and the same situation. “If you leave the official line, if you produce dissenting reports, then you will soon feel this. There are many ways to get you back in line quickly. If you don’t follow the guidelines, you will not keep your job long. Nevertheless, some of the leading journalists continue to believe that nobody can tell them what to write. “[T]he point is that they wouldn’t be there unless they had already demonstrated that nobody has to tell them what to write because they are going say the right thing. If they had started off at the Metro desk, or something, and had pursued the wrong kind of stories, they never would have made it to the positions where they can now say anything they like. Ultimately, this “socialization process” leads to a journalism that generally no longer independently researches and critically reports on geopolitical conflicts (and some other topics), but seeks to consolidate the desired narrative through appropriate editorials, commentary, and interviewees. “In all press systems, the news media are instruments of those who exercise political and economic power. In addition, our leading media and their key people are – in the spirit of Chomsky’s “socialization” – often themselves part of the networks of the transatlantic elite. See in-depth study of these networks: The American Empire and its Media. Indeed, most well-known publications basically may be seen as “establishment media”. It was only due to the Internet that Altschull’s First Law has been broken to some extent. Thus, in recent years a high-quality, reader-funded journalism has emerged, often outperforming traditional media in terms of critical reporting. Some of these “alternative” publications already reach a very large audience, showing that the “mass” does not have to be a problem for the quality of a media outlet. Will “political and economic power”, according to Altschull’s Law, retain control over the news, or will “uncontrolled” news change the political and economic power structure? 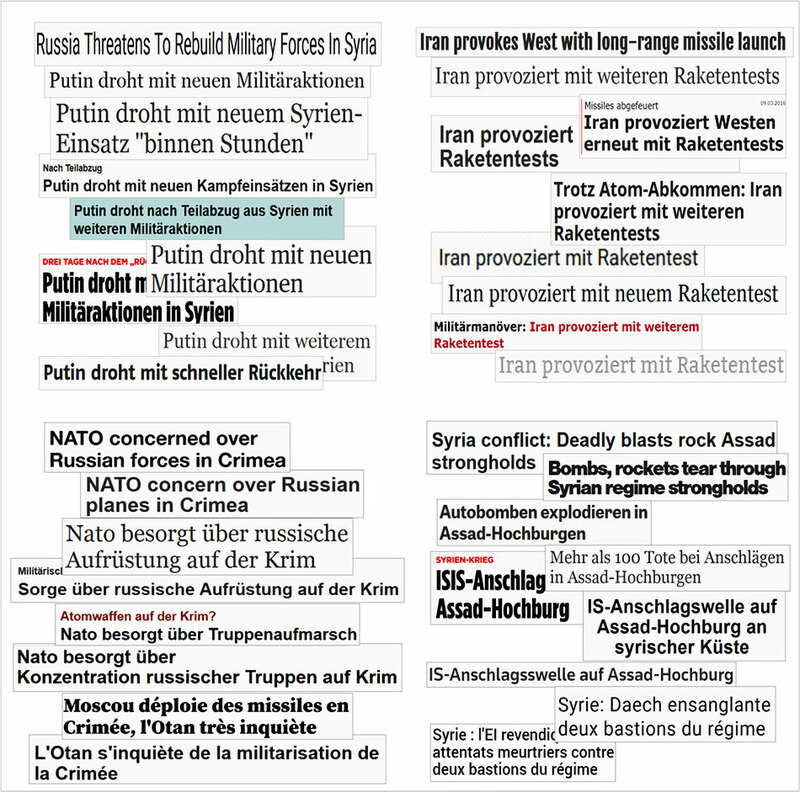 As part of a case study, the Syria war coverage of nine leading daily newspapers from Germany, Austria and Switzerland were examined for plurality of viewpoints and reliance on news agencies. The investigation period was defined as October 1 to 15, 2015, i.e. the first two weeks after Russia’s direct intervention in the Syrian conflict. The entire print and online coverage of these newspapers was taken into account. Any Sunday editions were not taken into account, as not all of the newspapers examined have such. 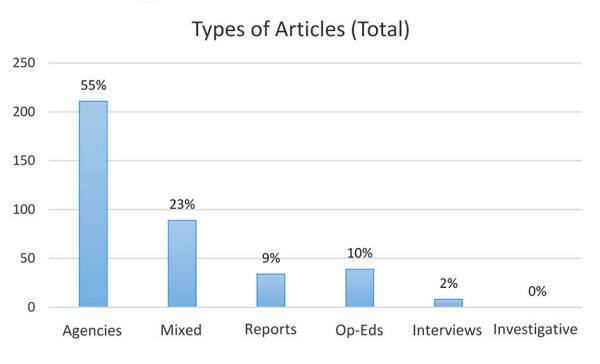 In total, 381 newspaper articles met the stated criteria. 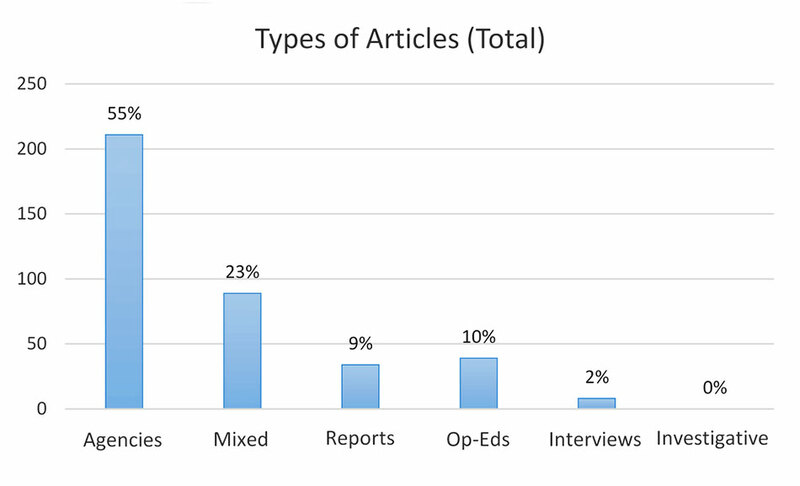 The following Figure 1 shows the composition of the articles for the nine newspapers analyzed in total. Most other types of articles were found in both the online and printed editions; some exclusive interviews and background reports were found only in the printed editions. All items were collected only once for the investigation. The following Figure 2 shows the same classification on a per newspaper basis. During the observation period (two weeks), most newspapers published between 40 and 50 articles on the Syrian conflict (print and online). In the German newspaper Die Welt there were more (58), in the Basler Zeitung and the Austrian Kurier, however, significantly less (29 or 33). 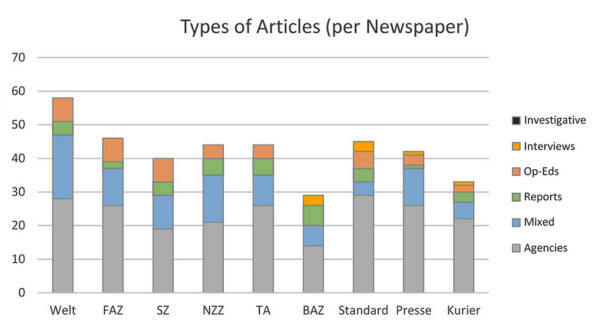 Together with the agency-based reports, the proportion in most newspapers is between approx. 70% and 80%. These proportions are consistent with previous media studies (e.g., Blum 1995, Johnston 2011, MacGregor 2013, Paterson 2007). In the background reports, the Swiss newspapers were leading (five to six pieces), followed by Welt, Süddeutsche and Standard (four each) and the other newspapers (one to three). The background reports and analyzes were in particular devoted to the situation and development in the Middle East, as well as to the motives and interests of individual actors (for example Russia, Turkey, the Islamic State). 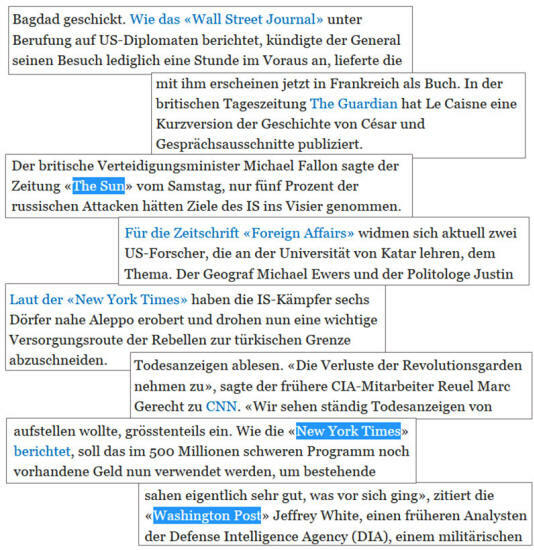 However, most of the commentaries were to be found in the German newspapers (seven comments each), followed by Standard (five), NZZ and Tagesanzeiger (four each). Basler Zeitung did not publish any commentaries during the observation period, but two interviews. Other interviews were conducted by Standard (three) and Kurier and Presse (one each). Investigative research, however, could not be found in any of the newspapers. In particular, in the case of the three German newspapers, a journalistically problematic blending of opinion pieces and reports was noted. Reports contained strong expressions of opinion even though they were not marked as commentary. The present study was in any case based on the article labeling by the newspaper. 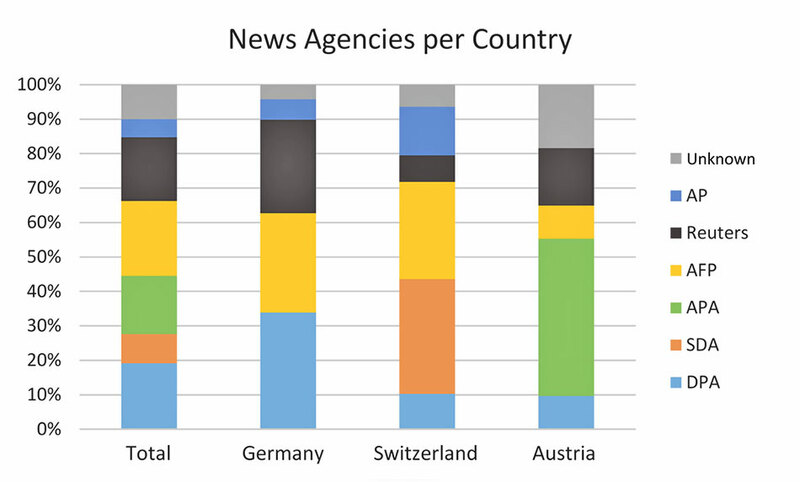 The following Figure 3 shows the breakdown of agency stories (by agency abbreviation) for each news agency, in total and per country. The 211 agency reports carried a total of 277 agency codes (a story may consist of material from more than one agency). It should also be noted that, for historical reasons, the global agencies are represented differently in different regions of the world. For events in Asia, Ukraine or Africa, the share of each agency will therefore be different than from events in the Middle East. 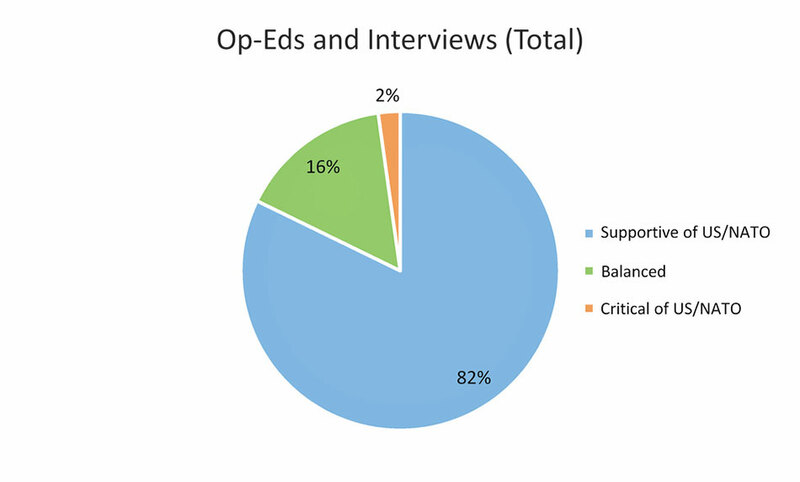 In the next step, central statements were used to rate the orientation of editorial opinions (28), guest comments (10) and interview partners (7) (a total of 45 articles). 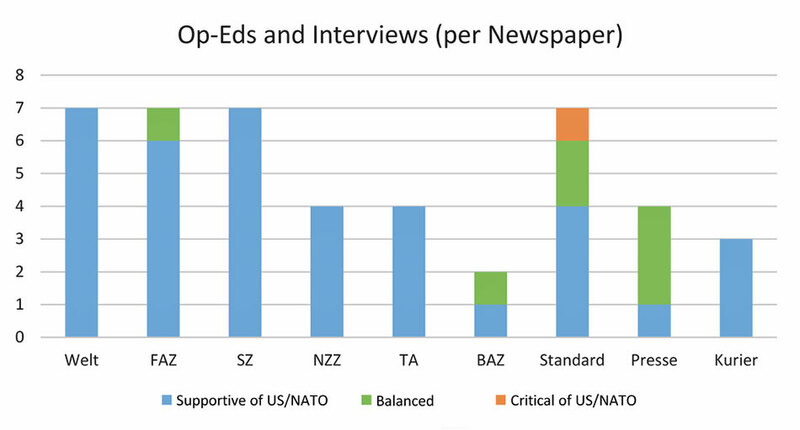 As Figure 4 shows, 82% of the contributions were generally US/NATO friendly, 16% neutral or balanced, and 2% predominantly US/NATO critical. 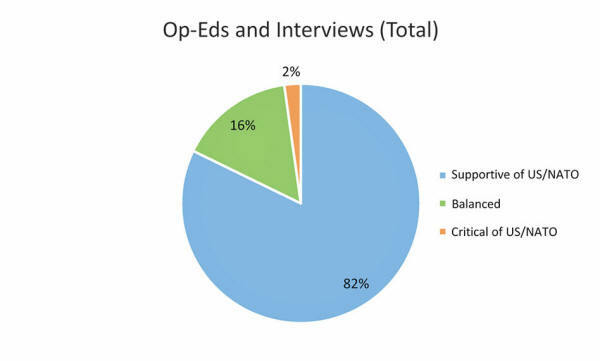 The following Figure 5 shows the orientation of the contributions, guest comments and interviewees, in turn broken down by individual newspapers. As can be seen, Welt, Süddeutsche Zeitung, NZZ, Zürcher Tagesanzeiger and the Austrian newspaper Kurier presented exclusively US/NATO-friendly opinion and guest contributions. This goes for FAZ too, with the exception of one neutral/balanced contribution. The Standard brought four US/NATO friendly, three balanced/neutral, as well as the already mentioned US/NATO critical opinion contributions. 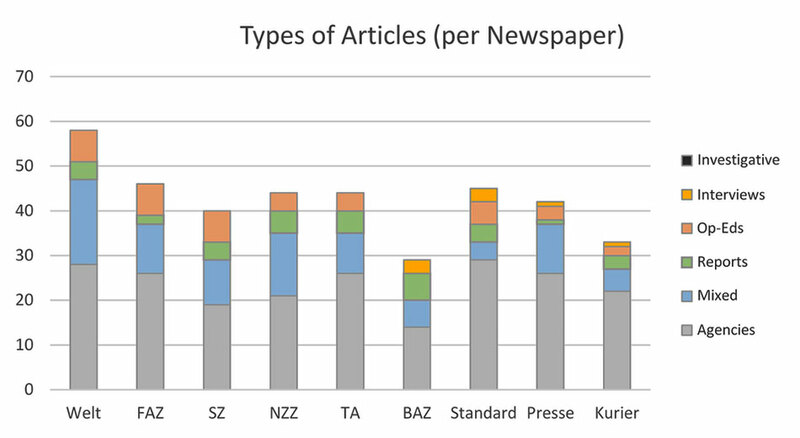 Presse was the only one of the examined newspapers to predominantly publish neutral/balanced opinions and guest contributions. The Basler Zeitung published one US/NATO-friendly and one balanced contribution. Shortly after the observation period (October 16, 2015), Basler Zeitung also published an interview with the President of the Russian Parliament. This would of course have been counted as a contribution critical of the US/NATO. 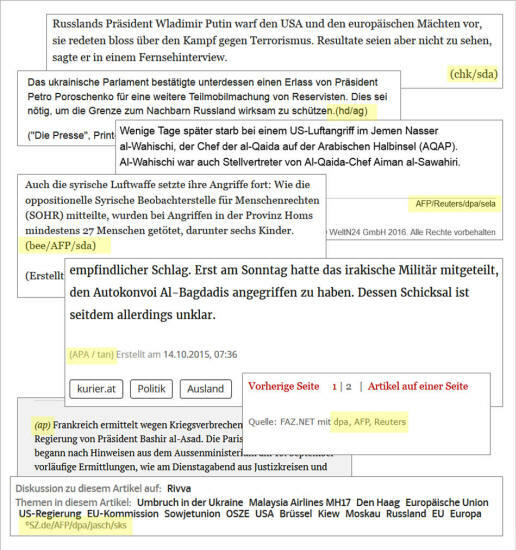 In a further analysis, a full-text keyword search for “propaganda” (and word combinations thereof) was used to investigate in which cases the newspapers themselves identified propaganda in one of the two geopolitical conflict sides, USA/NATO or Russia (the participant “IS/ISIS” was not considered). In total, twenty such cases were identified. …followed by German FAZ (three), Welt and Süddeutsche Zeitung (two each) and the Austrian newspaper Kurier (one). 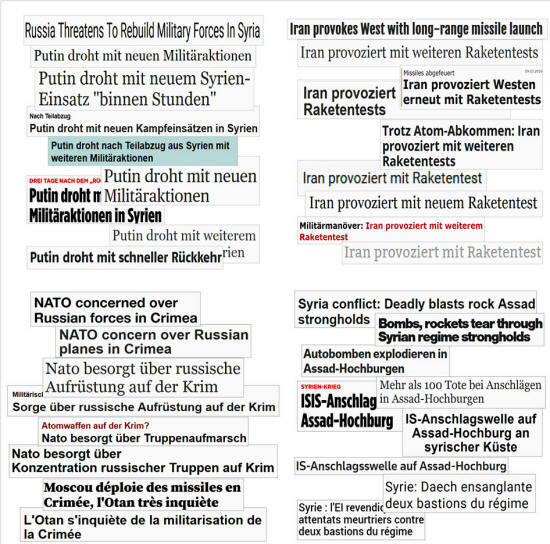 The other newspapers did not mention propaganda, or only in a neutral context (or in the context of IS). to conflict parties (total; n=20). Gritsch, Kurt (2010): Inszenierung eines gerechten Krieges? Intellektuelle, Medien und der “Kosovo-Krieg” 1999. Georg Olms Verlag, Hildesheim. Previous Previous post: Going Within-The Aftermath…What’s Next?